In 1935, two brothers were hunting deep in the woods in Ashe County, North Carolina. They were about 3 miles into the thick forest and had been hunting most of the day. It was starting to get dark and so they decided to pack up and get ready to leave. As they began their hike out, they heard something moving through the forest behind them. It was loud and almost sounded like it was “bulldozing the trees”. 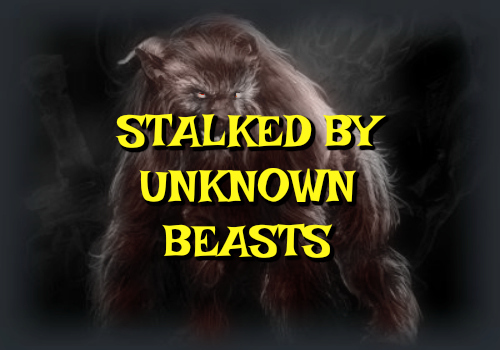 The men shined their light at it and were shocked to see a 9 foot tall creature with “blood red eyes” standing there staring at them. Frightened, the two men immediately began shooting at it with their 30/30 rifles. They could hear it make a squeal that they described as horrible sounding. It then covered its eyes and ran blindly into the woods. The two hunters turned and ran towards home. Looking back, the men believed that they may have actually shot the creature in the eyes especially given the way it covered its eyes and ran off into the woods. The men didn't know what it was only that it resembled a giant ape-like creature. They called it, The Devil Ape. In 1978, two friends, John and Paul, were walking in the woods in late fall. They were both in the sixth grade. They were out pretty late and it started to get dark. As they walked, they felt as though they were being watched. John noticed a shadow moving. At some point, they stopped and looked whatever was following them. The creature had, according to the witness, “cold, yellow eyes”. It began to growl at them. The two boys began to run. They eventually made it out of the woods. When they looked back, they saw that the creature had not followed them. The two boys, fearing they would be mocked, told nobody about their encounter. John would not go back into those woods again. Many years later, he was driving by the same patch of woods where he saw the creature and observed a “wolf head” peer out from above a bush on downside of incline. He estimated, given the height of the incline, the creature had to be 7 feet tall. The eyes were the same cold, yellow eyes he had seen that day in 1978. It watched him as he passed. To John, it felt like it was studying him, almost like it remembered him. He drove by the area again the next day, this time armed, and saw nothing. This happened in Hockomock in Southeastern Massachusetts. Side-note: Paul passed away in October 2009.